If you are a regular attendee here, you have heard 15 Thomas sermons from me fifteen times on the Sunday after Easter. Thomas is the Gospel every year the Sunday after Easter. Another regular topic is that every year, the Fourth Sunday of Easter is Good Shepherd Sunday. Therefore, this will be the fifteenth time I preach here on Jesus as the Good Shepherd. In our text today, Jesus teaches that He is the Good Shepherd. But a few verses earlier, Jesus also taught that He is the door for the sheep: “Truly, truly, I say to you, I am the door of the sheep. All who came before me are thieves and robbers, but the sheep did not listen to them. I am the door. If anyone enters by me, he will be saved and will go in and out and find pasture. The thief comes only to steal and kill and destroy. I came that they may have life and have it abundantly” (10:7–10). John 10 gives us this great good news because we need Jesus to be both of these things. 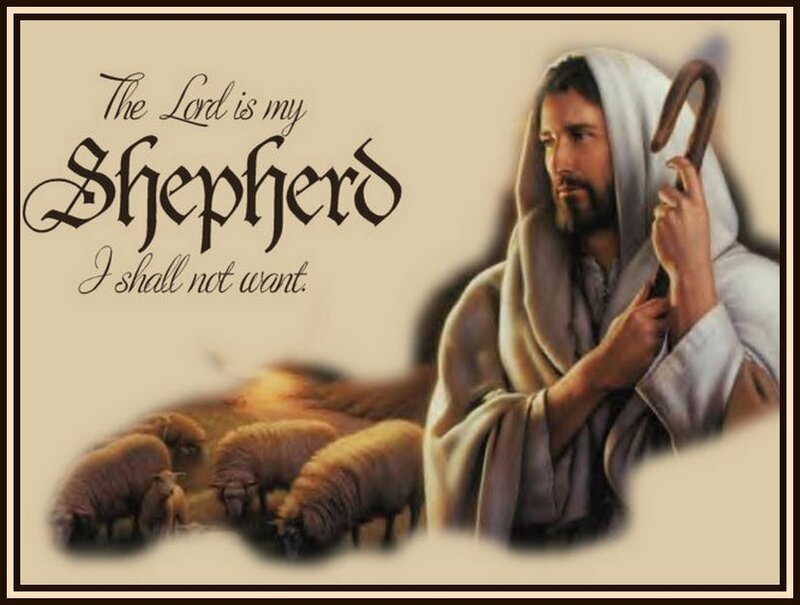 Jesus Is Both the Good Shepherd Who Protects His Sheep and the Door That Locks Out Those Who Threaten Them. It’s a good thing about having a Good Shepherd who’s also a door: there are those two sides. On one side of the door, there’s grace and mercy. There’s a good and loving shepherd who cares for His sheep. He opens to provide food and such as He leads the sheep to pasture and streams of living water. But He closes to provide protection from thieves and hired hands and wolves, the terms Jesus uses in our text for false shepherds: “I am the good shepherd. The good shepherd lays down his life for the sheep. He who is a hired hand and not a shepherd, who does not own the sheep, sees the wolf coming and leaves the sheep and flees, and the wolf snatches them and scatters them” (vv 11–12). On one side of the door is mercy, but on the other side is judgment. If you are outside, then you are outside of Grace. In today’s First Reading, Peter and John stood before the Jewish council, priests, and Sadducees, those who should have been the shepherds of Israel. They should have been leading the people to God, but they were leading them away. They were “outside the door.” This is seen in that the apostles were on trial because they’d healed a lame man in Jesus’ Name, they proclaimed Jesus’ resurrection and resurrection in Jesus’ Name. The council was greatly annoyed, so Peter and John said in their defense, “Let it be known to all of you and to all the people of Israel that by the name of Jesus Christ of Nazareth, whom you crucified, whom God raised from the dead—by him this man is standing before you well” (Acts 4:10). Peter went on to explain that with Jesus, there is “no other name under heaven given among men by which we must be saved” (4:12). Some of the same bad shepherds had revealed their true colors immediately before our text. In John 9, Jesus healed a man who was blind from birth. The Jewish leadership took issue with this healing because it had been done on a Sabbath Day. Jesus knew their laws were just a burden added to the people, rules that were not from God, and Jesus called them on this. And then they rejected Him and refused to believe in Him. They also threw the man who’d been healed out of the Temple. However, when Jesus found him and revealed to him that He was the Christ, the man believed in Jesus and worshiped Him. The Good Shepherd was His open door—but Jesus was a closed door to those who rejected Him, like the priests, the Sadducees, and the Pharisees. Think of it like the door that Noah and his sons built into the ark. On the day it started to rain, Noah and his family huddled inside the ark. The hand of God then closed that door. As the door shut, the rain that fell for God’s judgment on the earth was kept safely outside. For Noah and his family, for those who had faith and believed God, the door provided protection. And then, when the flood subsided, and the waters were gone, the door opened and Noah went out to find God’s blessing on the earth. But for those outside the ark, that door meant judgment. The door was shut to those who did not believe. They died. It’s the same door, but that door is received much differently depending on which side of the door you’re facing. The same can be said for Jesus. Those of us who believe are on the inside of the door. For us, Jesus is the Good Shepherd who died and rose for us. He knows us and loves us, and likewise, we know Him and follow Him. We know the sound of His voice and follow where He leads. But for those who do not believe in Jesus, He is a judge. They refuse to see His goodness and mercy. They reject Him. They reject forgiveness. They reject salvation. They reject Him and then blame Him when things don’t go their way. But that’s not you, right? You know Jesus is your Good Shepherd. You know Jesus’ gifts and blessings and you know His protection. Just as Noah and his family were protected from the waters that rose to destroy the earth, you are protected from the wrath of God. Just as sheep who are put safely away inside the pen are protected from what’s out there in the dark of night and the wolves in the shadows, you are protected from the devil and his evil angels. You are safe inside the Church, where God feeds and nourishes you. You hear His voice as it’s brought to you through preaching and His Word. You receive living water that flows from His font. You eat the food that He’s prepared at His banquet table, bread and wine that is His body and blood and that offers you forgiveness of sins, life, salvation. Jesus is your Shepherd, and you are protected from what’s outside. Jesus, the door for the sheep, calls to you to come to Him and enter through Him. We are tempted by that prize we have, the prizes of this earth—the world and all its glory. We are tempted to reject Jesus and deny His gifts. There are people who are satisfied with the “prizes” they have in their earthly treasures. But behind that door, on the other side of that door, you will not find a zonk. There we find heaven and all its glory, all the blessings of God almighty given for you. Come, enter through the door that is Jesus and find your Good Shepherd waiting for you. Adapted from Concordia Pulpit Resources, Vol. 28, Part 2.